A digital signage can come across as a standalone device or a part of network containing hundreds or thousands of digital signs. It could be centrally managed or have a one-by-one management. Whatever the type of digital signage is, the core components that form a digital signage system include: a display, content management software, content and network. Display types such as LCD, plasma and other varieties of flat panel screens, increasingly with touch screen and mobile device interactivity capabilities are commonly used for digital signage systems. Content in digital signage systems is managed with the help of sophisticated digital media players that are capable of managing video graphics, web feeds, images, text and other forms of content. For sourcing real-life data into digital signs or having a central control over the content being displayed, a wired or wireless network such as WAN or LAN is required. The increased preference to digital advertisement modes has led to a vast rise in uptake of digital signages in the past few years and the trend is likely to remain strong in the next few years as well. 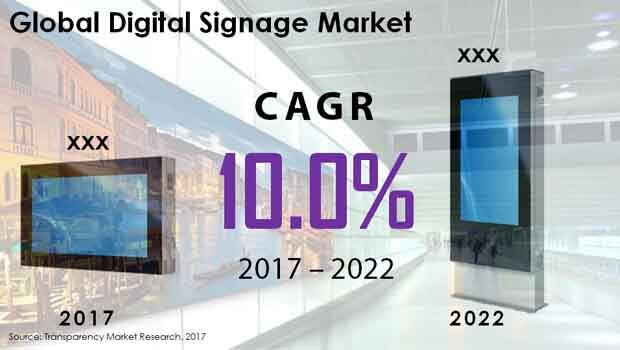 According to the report, the global digital signage market will embark upon a promising growth path in the near future, expanding at a lucrative 10% CAGR from 2017 and 2022, rising to a revenue valuation of US$34.67 bn by 2022. Some of the leading applications of digital signage are found in area such as healthcare, corporate, education, banking, entertainment, retail, and transportation. Of these, the retail industry is presently the leading contributor of revenue to the global digital signage market owing to the high usage of these products for purposes such as digital advertisement, customer engagement, and display of data related to new products and discount schemes, etc. The demand for digital signage is also high across the transportation and BFSI sectors and is expected to make up for a large share of the overall market by the end of the forecast period. Based on product type, the report segments the global digital signage market into media players, displays, software for network, medial revenue, and services. Of these, the segments of media players and displays account for the dominant share in the overall market. Over the forecast period, the trend is likely to remain strong. Based on display technology, the report segments the global digital signage market into PDP, LCD, LED, OLED, rear projection, and front projection. Based on geography, the report segments the global digital signage market into Latin America, Europe, North America, Asia Pacific excluding Japan, Middle East and Africa, and Japan. Owing to the presence of a highly evolved technology infrastructure, the rising numbers of players developing products for industrial applications, and the increased uptake of digital displays in the BFSI and retail sectors all contribute to the promising growth prospects of the regional market. The regional market is expected to exhibit an impressive 11.1% CAGR from 2017 to 2022 and retain its dominant position. The Asia Pacific market is also among one of the leading contributors of revenue opportunities to the global digital signage market, thanks to the impressive growth of the modern retail sector. Increased demand for technologically advanced products is also expected to work well for the regional market over the report’s forecast period. The market in Europe will benefit from high funds allotted by governments for the installation of digital signage in government offices so as to maintain a consistent flow of data. According to the report, the vendor landscape of the global digital signage market is highly concentrated owing to a large number of local as well as international vendors. Some of the leading companies competing in the market are BroadSign International, Panasonic Corp., NEC Corp., Sony Corp., Cisco Systems Inc., Advantec Co. Ltd., LG Electronics, Omnivex Corp., Sharp Corp., and Samsung Electronics Co. Ltd. The global market for digital signage is witnessing a significantly high rise, thanks to remarkable technological advancements in infrastructure in the commercial as well as the public sectors, especially in emerging economies. This study presents a detailed assessment of the drivers and the restraints that govern the dynamics of the worldwide digital signage market, together with their impact on the demand for digital signage during the period from 2017 to 2022. In addition to this, the research report talks about the potential opportunities in this market on the global as well as the regional level, emphasizing on the analysis of market attractiveness, in which the applications have been marked on the basis of their growth rate, market size, and general attractiveness of this market. The market has been forecast based on constant currency rates. The prices of digital signage vary in each of the regions due to the demand-supply scenario in the respective region, which turns into non-following of a similar volume-to-revenue ratio for each individual region. The individual pricing of digital signage products for each of the application segments has been considered while estimating and predicting the revenue of this market on the global level. The regional average price has been taken into consideration during the bifurcation of the market into various segments in each of the regions on the basis of several market parameters. The research report presents the overall size of the worldwide digital signage market in 2017 and the forecast for the next five years up to 2022. The size of the market and forecast for each of the product segments is offered in the context of the global as well as the regional markets. Numbers provided in this report are derived based on demand generated from different applications and types of raw materials. The study provides a decisive view of the digital signage market by segmenting it on the basis of the display technology, offerings, application, and the regional spread of this market. Based on the offering, the market is categorized into displays, media players, services, software for network, and media revenue. By display technology, the market is bifurcated into LCD, PDP, OLED, LED, front projection, and rear projection. On the basis of application, the market is segmented into the corporate, education, healthcare, entertainment, banking, retail, and the transportation sectors. The regional segmentation of this market includes North America (Canada and the U.S.), Latin America (Argentina, Brazil, and Mexico), the Middle East and Africa (South Africa, Turkey, Israel, and GCC countries), Asia Pacific excluding Japan (India, China, South Korea, Indonesia, Australia, and Singapore), Europe (the U.K., Italy, France, Germany, Spain, and Nordic countries), and Japan. The market estimates for this research study have been based on the volume produced, with revenue being determined through the regional pricing trends. The cost for commonly utilized grades of digital signage in each of the applications has been taken into consideration, and customized product pricing has not been included. Demand for digital signage has been derived by analyzing the global and regional demand for digital signage in each application. NEC Corp., Advantec Co. Ltd., Panasonic Corp., Cisco Systems Inc., Sony Corp., Omnivex Corp., Sharp Corp., BroadSign International, LG Electronics, and Samsung Electronics Co. Ltd. are the leading players in the global digital signage market.